Posted On July 10, 2015 by Team iCynosure. There are two things that everyone wants to do in life at some point or another. One is falling in love and the other is travelling without a care in the world, just like a nomad. As a person, one embraces so much through both love and travel gaining at every step. Success in love comes in form of a gorgeously understanding and supportive partner while success in travel comes from the experiential. And to be a real traveller you need to hang in your boots at every junction that fascinates you. Not only should you be able to stay spontaneously in a random place at any time but you must be able to capture the beauty of the place to cherish forever. For my friend Kelly who writes at ShivangiReviews, her love for capturing all things beautiful is nurtured by a hi-end camera as she wishes to buy a Canon EOS 5D Mark III Kit for herself, reemphasizes her love every detail and preserving the memories forever. To make and preserve memories, you need to take those amazing breaks from time-to-time. I am of the advocate that holidays bring people together, give an opportunity to understand each other and make the relationship so much stronger. If all my wishes came true, I would perpetually be on a holiday all my life. But since wishes are not horses, it becomes that much more difficult to do what you wish for, from time to time. Especially when hubby dearest is such a workaholic that even a short-getaway with him has so much baggage it becomes more of a task than a rendezvous. If there was a wishing well, I would definitely go there every day and drop in coins to combat his email notifying smartphone, the perpetual tapping of the laptop keyboard and the numerous calculation that keep going on in his head. Since an empty head is a devil’s workshop, to attain this impossible feat I wish to gift him the most appropriate Victorinox Suitcase that houses only the essentials. 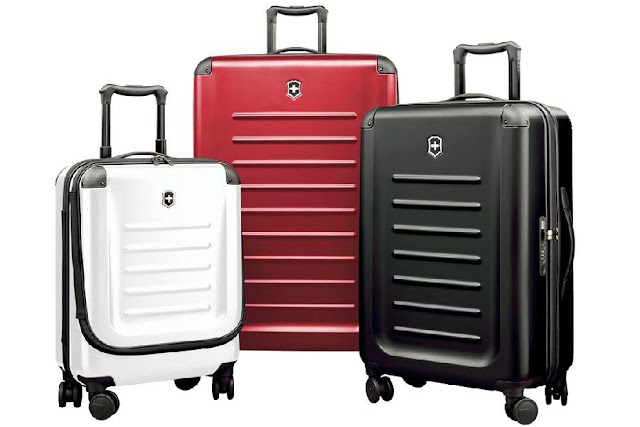 Stealing him away from his work, the Victorinox Cabin Luggage 20.9 will be the perfect accomplice to take him away to destinations unexplored without the hustle-bustle of work. Pack in the most necessary, minimum things in the 200 X 380 X 530 mm space and going to unearth the beauty of the world. Given his love for travel, he will most definitely enjoy exploring numerous places in a loop one after the other armed with a bag that offers him optimum space with a TSA Combination Locking Mechanism backed by a 10-year warranty. And that’s what wishes are really made of… doing what you love to do on a repeat, just like I mentioned earlier… be on a holiday perpetually all my life. And if every holiday has that strong hand holding mine, that gorgeous smile widen because of me, that fun-loving man doing some crazy stuff, those lips whisper into my ears, is there anything else I could ever wish for? Travelling with him without the work baggage completely immersed in two things… love and travel will be a wish come true. So no more waiting anymore because #AbHarWishHogiPoori with Flipkart.